It seems Beyonce spared no expense when it came to her baby girl’s birth. Any why would she? She’s Beyonce. 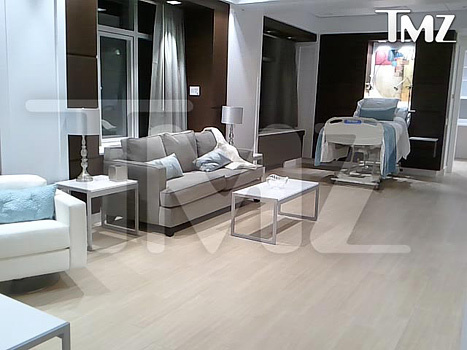 TMZ has released photos of her beautiful hospital suite which costs around $700-$800 per night. A tad expensive, yes, but that’s not an insane amount. Her posse used about four rooms during her stay – evidently her entourage travels with her for her birth – ew. Why? In case she decides to record an album during delivery or needs a sequins bodysuit? Anyway, so four rooms would’ve run her about $3,200. Again, not a big deal when you’re sitting on kabillions of dollars. Click image below to see more of her hospital suite! So why so much drama about Beyonce’s baby? It really didn’t cost a ton if the above info is correct. Wait, there’s more! On Wed. of this week the NY State Health Department got “complaints from new parents who claim they were mistreated by the staff at Lenox Hill Hospital while Beyonce was giving birth in the VIP room.” The parents who were having babies in the hospital while Bey & Z were there said, “they were neglected by staff and prevented from visiting their newborns … due to the drama surrounding the superstar.” Gee, ya think? Let me tell you this, had I given birth at my hospital while a HUGE superstar like Beyonce was there, I would’ve delivered my baby myself with a bedpan and a sheet. I’m 1,000 times certain I would’ve been totally ignored. They ignored me most of the time anyway! Talk about ruining a special moment for you and your family. Who cares about your normal, boring baby when BEYONCE and JAYZ are birthing royalty down the hall. Seriously? You know I’m right. The baby rumors continue to swill about and who knows what’s actually true. All I know is that kid is gonna hear the most unbelievably cool nursery rhymes ever.